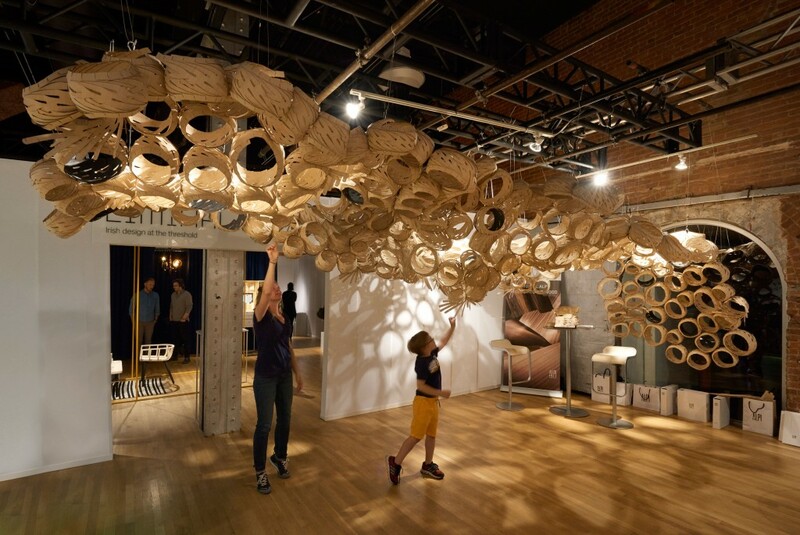 Last Chance To Enjoy Great Temporary Projects! SCE invites you to enjoy the Street Seats project and Pansa/Panzer installation in their final days! 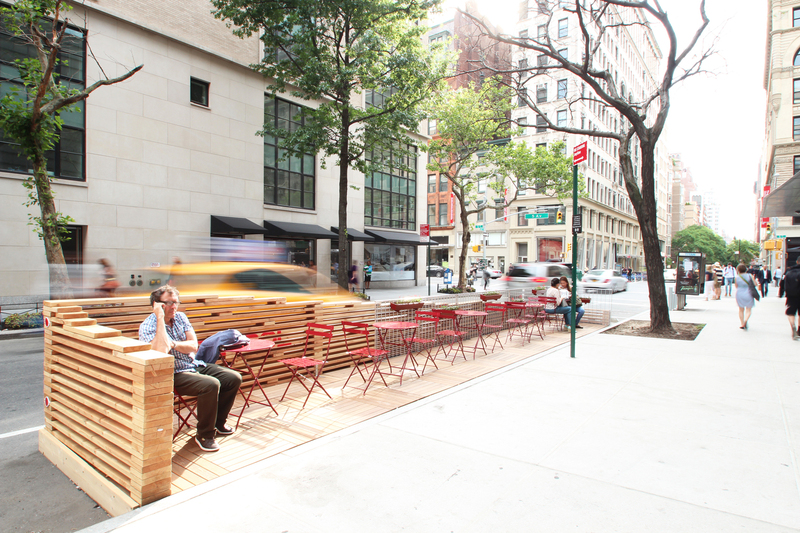 Street Seats is currently located on 13th St. & 5th Ave., and will go into hibernation November 4th, and reemerge in Spring 2016 with a new design by students enrolled in the NEW Temporary Environments Minor. Pansa/Panzer is currently on display in the Sheila Johnson Design Center lobby, and will also be disassembled on November 4th. to celebrate the Temporary Environments projects and for a chance to sign a petition in support of the next Street Seats project for Spring 2016. The DOT’s Street Seats program fosters seasonal public space that reclaims portions of New York City’s streets for much needed public space. These public spaces generally include seating and tables for a neighborhood to create an attractive setting for eating, reading, working, conversing, and taking a rest. In 2015, Parsons SCE teamed up with the DOT to create a proposal that evolves the standard DOT design. Ten SCE undergraduate students designed and built a successful Street Seats project at the Northeast corner of 13th St. and 5th Ave. The 40ft x 6ft design incorporates the necessary seating and tables, but goes further to incorporate vegetation, graphic identity, and outdoor exhibition space. Sean Barbe, Elysia Belilove, Eliza De Haas, Gabrielle Hamilton, Sean Jones, Preet Kalra, Michelle Misciagno, Aura Phongsirivech, Mark Rakhmanov, Aditi Shetye, Nicholas Brinen, Manhattan Community Board No. 2, The New School’s Tishman Environment and Design Center, The New School’s University Student Senate, The New School’s Green Fund Research Grant, and NYC DOT. The Alpi + Parsons collaboration celebrates student design and exploration of Alpi’s innovative reconstituted wood veneer; a material developed 50 years ago which continues to lead in areas of environmental responsibility, quality, and focus on design. Led by adjunct faculty, William Haskas, the Temporary Environments course at SCE challenged students across undergaduate and graduate programs in Architecture, Interior, Lighting, and Product Design to investigate how the sum of parts creates a whole. Titled Pansa/Panzer, Haskas states that the installation’s name is, “derived from the German word that signifies shell, and the Spanish which colloquially signifies belly.” The Pansa concept embodies the language of an armature that intertwines and fluidly twists around one another.” Each component is CNC milled double ply .006 thick Alpi Veneer (nested to less than 3% material waste). The cut veneer yields a flat unit with multiple fibers or fingers that elastically weave into a structural yet naturally ordered bulbous form. The project is composed of 280 individual units (a total of 4,480 woven fibers) that dynamically respond to complex behavioral forces (either internally generated by the system or external considerations). Samuel Falco, Ariel Gonzalez, Olivia Marrese, Giulio Milano, Semi Park, Manvee Sharma, Caleb Sillars, Joeseph Spinnato, Laura Suppan, Verna Yilmaz, and William Haskas. Please contact Nicholas Brinen (brinenn@newschool.edu) or William Haskas (haskasw@newschool.edu) for more information. « Waste Not: Shaping The Public: Social Machines. Working Over Conflict.